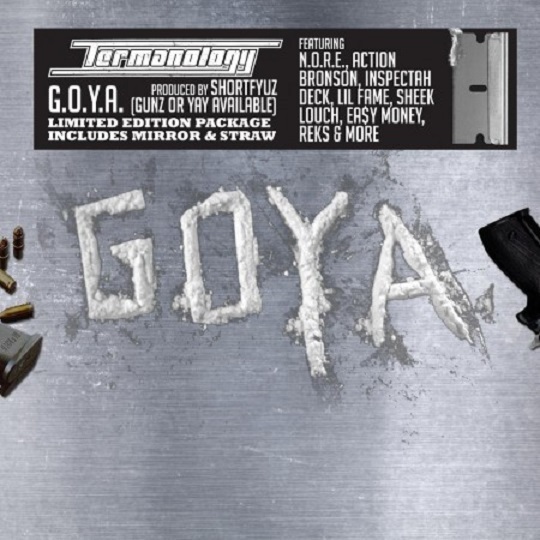 Termanology is back with another standout track called “Take My Turn” featuring Action Bronson and singer Jared Evan off his his new album titled Goya (Guns or Yay Available). Produced by Shorty Fuz, the smooth track finds Term dropping braggadocios rhymes on his female interests, living the high life and hitting the streets to put in work while Bronson follows suit but finds the time to include raps about different cuisines. Evan takes the wheel on the track’s melodic chorus. This entry was posted in Audio and tagged action bronson, album, GOYA, hip hop, jared evan, rap, shorty fuz, take my turn, termanology. Bookmark the permalink.